Eating non-fat foods can help increase weight loss and also protect the heart. Eating too much fat can contribute to heart disease and type-2 diabetes as well as obesity. You can enjoy plenty of healthy and tasty non-fat snacks that take little to no prep time to create. Dairy foods are important since they contain the essential mineral calcium. You need calcium for strong bones and teeth. Eating a diet rich in calcium can help prevent osteoporosis, which is a condition that causes brittle bones. Diets rich in dairy also help to maintain bone mass, which decreases with age. You need vitamin D to enhance calcium absorption and to maintain normal calcium levels in the body. You can get these health benefits from eating non-fat ice cream, cottage cheese, hard cheese and yogurt. Some brands of non-fat milk also contain probiotics, which balance good bacteria in the gut. 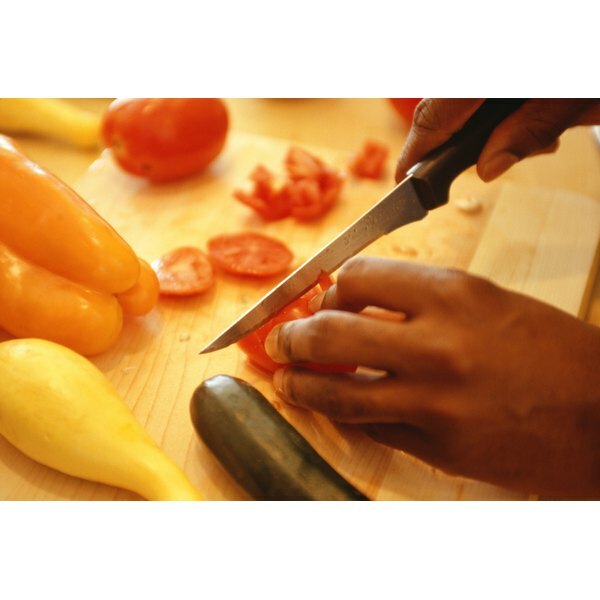 Fruit and vegetables are naturally fat free, when prepared steamed, raw or boiled. The recommended guideline is to eat at least five servings of fruit and vegetables per day. You should ideally eat a variety of fruit and vegetables of different colors. Fruit and vegetables contain dietary fiber, which is necessary for digestive health and bowel maintenance. They also contain an array of vitamins and minerals, which protect the body from free radicals, maintain good brain health, promote growth and health of nails and skin and protect the eyes from damage. If you wish, you can juice your vegetables together or add your fruit in a blender with ice and dairy and make a delicious and healthy smoothie. Whole grain bread, non-fat fiber bars, quinoa, oats, brown rice and buckwheat are all good choices for non-fat whole grain snacks. You can buy quinoa and buckwheat as flour and use them in the same way as normal flour. Whole grains contain both soluble and insoluble fiber, which work to regulate blood sugar, lower blood cholesterol and increase weight loss. You can mix whole grains with any food group to make snack bars, smoothies, sandwiches or trail mix. The USDA recommends consuming the majority of your food from this category. For those who want to have their cake and eat it too, you can. If you are trying to lose weight but you still want to feed your sweet tooth, you can go for non-fat desserts such as fruit gelatin, pudding, ice cream, frozen yogurt and snack bars. Some non-fat desserts offer even more healthy benefits, such as dark chocolate, fruit salads or dried fruit or yogurt-covered almonds.